When you choose a Yamaha utility vehicle, you are opting for one of the most respected options on the market. With our selection of Yamaha side by side parts, find everything you need to experience the intended power and longevity of your model. While the history of the Yamaha UTV might not be as long as others on the market, it is certainly a story of near immediate success. When they first introduced their Rhino UTV in 2004, they instantly filled a void in the industry and would take the automotive world by storm with just this one model. Made to beat the competition in every way imaginable, the Rhino was the first UTV with a focus on speed and agility in a more compact size than comparative options on the market without sacrificing on the matters of safety and stability. This streamlined approach made Yamaha side by side vehicles an instant hit and they would go on to revolutionize the industry with every new model they created in this vehicle category. 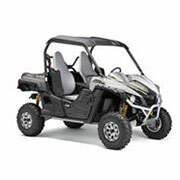 We are honored to bring you OEM Yamaha side by side parts to cover all their UTVs, so you can experience the power and skill of this respected manufacturer at full capacity. We offer a wide range of Yamaha side by side parts to meet your needs with ease. As an authorized dealer, we offer OEM solutions direct from the manufacturer, so you get the right specifications and performance for your favorite vehicle without any worry. These high-quality solutions are made specifically for the vehicles and years specified so you can buy with confidence. We offer a wide range of models, from the Rhino 660 to the Viking and Wolverine lineups, to ensure you get exactly what you need for your specific model. In addition to a wide range of models and years, you will also find a range of part types or vehicle areas covered with our inventory of solutions. Whether searching for a clutch or camshaft chain, we have it all with our inventory of high performing Yamaha side by side parts. Find it all right here!